Pulmonary embolism resulting from deep vein thrombosis—collectively referred to as venous thromboembolism—is the most common preventable cause of hospital death. Pharmacologic methods to prevent venous thromboembolism are safe, effective, cost-effective, and advocated by authoritative guidelines, yet large prospective studies continue to demonstrate that these preventive methods are significantly underused. 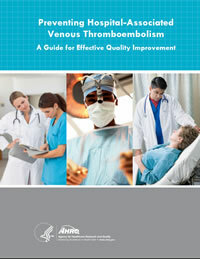 Based on quality improvement initiatives undertaken at the University of California, San Diego Medical Center and Emory University Hospitals, this guide assists quality improvement practitioners in leading an effort to improve prevention of one of the most important problems facing hospitalized patients, hospital-acquired venous thromboembolism. The author would like to acknowledge those who contributed to the first version of the guide, most notably Dr. Jason Stein of Emory University. Dr. Maynard has also been inspired by all those who have engaged in collaborative improvement efforts using the previous version of this guide; these have greatly informed this updated and revised version. Eileen M. Hogan, M.P.A., Public Health Analyst. Finally, AHRQ and the author acknowledge the patients and families who have shared their personal stories about the impact VTE had on their lives and their insights into the importance of prevention efforts. The author discloses that he has acted as an expert in cases involving venous thromboembolism (VTE). Dr. Maynard also sits on an expert review panel for a phase 3 study on rivaroxaban for VTE prophylaxis in medical patients (Mariner study, Janssen Pharmaceuticals). He has no other affiliations or financial involvement (e.g., employment, consultancies, honoraria, stock options, grants, patents received or pending, or royalties) that conflict with material presented in this guide. Suggested Citation: Maynard G. Preventing hospital-associated venous thromboembolism: a guide for effective quality improvement, 2nd ed. Rockville, MD: Agency for Healthcare Research and Quality; October 2015. AHRQ Publication No. 16-0001-EF.